After one month since the launch of the awaited XOOM tablet at the CES 2011 in Las Vegas, the Motorola XOOM tablet price was finally revealed. 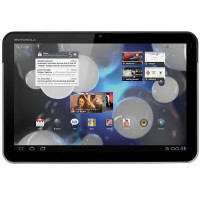 Also known to be the first tablet device powered by the Android 3.0 Honeycomb OS, Motorola XOOM tablet will sell for $799 at Verizon Wireless without any contract. As you might know, there are two versions of Motorola XOOM available, the Wi-Fi only version which will sell for $600 without any contract and the 3G version, available for $799, also without contract. The Honeycomb tablet packs a 10.1 inch capacitive touchscreen with 1280 x 800 pixels resolution, powered by 1 GHz dual-core processor. Motorola XOOM features 2 cameras, a rear-facing camera with 5 megapixels and HD video recording capabilities, but also a 2 megapixels front-facing camera for video calls. Motorola XOOM supports up to 10 hours of video playback, and charges in half the time of competitive tablets on the market. XOOM tablet comes with Google Maps version 5.0 with 3D interaction and with Adobe Flash Player. Motorola XOOM will be upgraded to 4G LTE later this year. Beside the price, Sanjay Jha also confirmed that “nearly all Motorola products will use Google’s Android software this year“, but he hasn’t revealed any other details.